The Government of St. Kitts and Nevis has a long running “Citizenship-by-investment” program attracting foreigners, who make a substantial contribution to the development of the country. Investors along with any family members, can directly qualify for citizenship through investment, either by making a donation or investment in real estate purchase. St Kitts passport is an excellent second passport for visa free travel to over 100+ countries in Europe, Caribbean. It usually takes 6 months to receive the passport after the investment is made. – Tax free – no income or wealth tax. – Easy second passport and citizenship for your family members. – Privacy in small peaceful country. – Choice of Real estate investment. The St. Kitts & Nevis passport is very well regarded and has excellent reputation, and only relatively few passports have been issued under this citizenship-by-investment program by the Government. It is a cheapest program to gain second citizenship for Americans. Important: We work with many law firms in St.Kitts, officially appointed and authorized by the Government of St. Kitts and Nevis to represent and promote the Citizenship-by-Investment program. Effective April 2018, the government reduced prices and introduced new Sustainable Growth Fund. Real estate investment also reduced. St Kitts and Nevis has launched new Sustainable Growth fund, effective from April 1, 2018 after the expiry of Hurricane Relief Fund. The Sustainable Growth Fund for a single applicant will require a contribution of US $150,000, inclusive of Government fees. The contribution for a family of up to four will be US $195,000 following incremental steps. The fund will benefit St Kitts and Nevis in sustainable areas such as healthcare, education, alternative energy, heritage, infrastructure, tourism and culture, climate change and resilience, and the promotion of indigenous entrepreneurship. 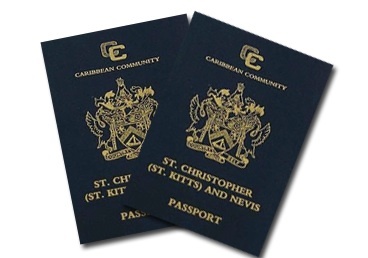 The St Christopher (Kitts) and Nevis passport issued is valid for 10 years, which can be renewed thereafter. Please note it takes about 3-4 months processing time. We can arrange for meetings in Dubai, London, Zurich. Please mention for appointments when you send us the online application. St Kitts and Nevis has launched new Sustainable Growth fund under the CBI programme, effective from April 1, 2018 which will resume after the expiry of Hurricane Relief Fund. The Sustainable Growth Fund for a single applicant will require a contribution of US $150,000, inclusive of Government fees. The contribution for a family of up to four will be US $195,000 following incremental steps. HRF fund option is closed as of March 30, 2018. The Sugar Industry Diversification Foundation (SIDF) is a charity setup by Saint Kitts Nevis Govt to raise funds for the displaced sugar industry workers. The minimum contribution about is $250,000 per person and it is non-refundable by the Government, once passport is granted. The SIDF has $250,000 donation + Government fee + Due diligence fee for one person. Additional costs apply for more family members. Please see the fee schedule for single applicant and any accompanying family members. The SIDF option is the fastest and cheapest way to attain second citizenship and the processing time takes 4-6 months. The above mentioned include all government and due diligence and application fees. Please also refer to Frequently Asked Questions page or you may use this contact form for more information. The real estate investment is a recoverable investment, but it is quite expensive because the minimum investment needed is USD 200,000, plus purchase costs, plus citizenship costs (see below). We work with various real estate developers in St.Kitts and Nevis. For example: The Kittitian hill, Christophie Harbour is a Government approved real estate project, which qualifies for citizenship. We also assist clients with numerous other Govt. approved real estate developer projects, through our real estate consultant in St.Kitts and Nevis. For the list of projects, please see this page. The Government requires either an investment in approved real estate project with a value of at least US$ 200,000 plus payment of various registration and other fees like Govt fee, due diligence fee, passport fee etc.. Note: The real estate option is a recoverable investment however, you can only sell your property after 7 years. As of new regulations from 2012, the next buyer qualifies for citizenship. We can arrange for meetings in Dubai, London, Switzerland or in St.Kitts. Please contact us for appointments when you complete our online application. Disclaimer: This website is unofficial site, not affiliated to or endorsed by Government(s) or official sources. We assist clients with document preparation and filing, legal advice, housing , real estate, taxation, investment advice. All program information including services / forms can be obtained from Government authorities for free.